My friend, Donna, and I have recently become antiquing buddies. 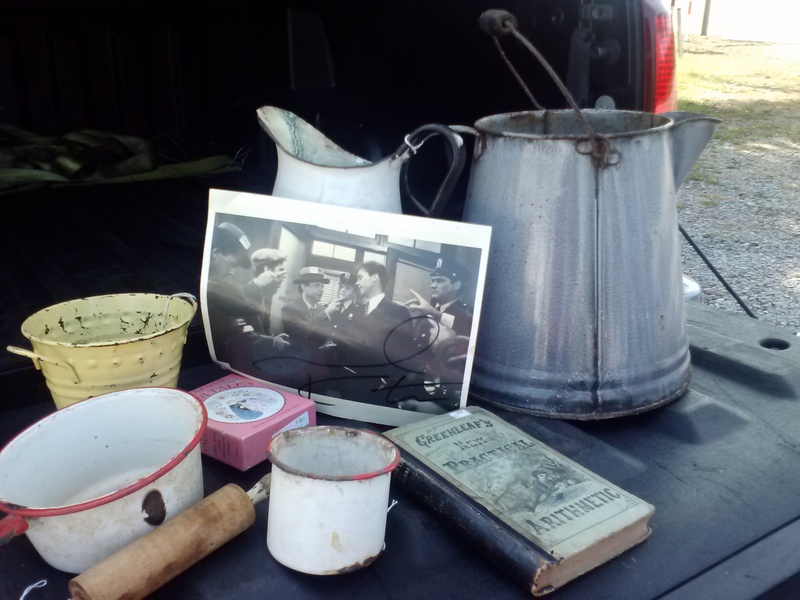 She suggested a (possibly) weekly blog post focusing on my treasure hunt finds. Earlier this summer, Donna told me about a new-to-me antique shop. It’s only open one weekend each month, and this past weekend was “it” for July. Unfortunately (for Donna), she was out of town on vacation. But Marshall readily agreed to accompany me. He IS his mother’s son. To torment Donna keep Donna informed, we placed all our finds on the tailgate of Motor Man’s truck and took this picture. I then texted it to Donna. My half of the goodies includes all of the enamelware and the miniature rolling pin. The antique Arithmetic book, published in the 1800’s, the 8×10 glossy photo, and the tiny collection of fairy tale books (pink cover) are Marshall’s. He’s still researching information on the photo, the fairy tale book set is identical to one he had as a child, and he’s finding the word problems in the post-Civil War math book to be interesting reading. The graniteware coffee pot will be displayed in my kitchen, and the more well-used enamel pieces will probably become outside flower planters. I thought the the little yellow pail would be cute filled with seashells. Here’s the large white enamelware pitcher that’s barely visible in the background of the above photo. It makes the perfect planter for this sedum. As of now, I’m planning on Wednesdays being Treasure Hunt day here on These Days. Feel free to comment and tell us about your favorite shops and the treasures you find. This entry was posted in Days at Home, Family, Traveling Days and tagged antique arithmetic book, antique shops, enamelware, fairy tale book, graniteware, treasure hunting. Bookmark the permalink. Treasure Hunt Day for a weekly blog – I love the idea AND you do a lot of antiquing so should have lots of fun photos to share. You have “treasure radar” when it comes to antiquing….I’ve seen it first hand ! I know you’ll be antiquing again when you go to Cambridge…Is that this weekend? I hope you come home with more interesting finds! Wonderful treasures that are getting to live again. A favorite pastime of me and my husband. The Antique Factory in Verona, VA – Allow HOURS if you ever go there. Our favorite sites are the little out-of-the way places. We’re still trying to get to Spring Grove – maybe August. How nice of Marshall to go along, and do his own mantiquing with you. You need to come “do” Phoebus again soon. I will gladly tag along! Well! Wednesdays are going to be fun here! Not that every day isn’t fun. Maybe I should say special for treasure seekers.. 🙂 Looking forward to next Wednesday! It was a fun trip – this shop is a good one – not flea-market, and not overpriced “gifts” ordered from a catalog and delivered to their door by a truck ! What a fun thing for mother and son to do. Great finds by the way! “one man’s junk is another man’s treasure”, so true. I have to go treasure hunting, you never know what you might find. You and Marshall made some great finds. Dianna, where is this shop at? I would love to check it out sometime. The sedum looks great in the pitcher! It’s interesting to see how “treasures” can be used. I love hunting for treasures and I have always found some good things at this one place in Kidron, OH where the Omish live. I wanted to purchase a microphone stand so badly and display it in my home, but I forgot to go back to where I saw it in the store and left. I wish I would have picked it up! Treasures are in the eye of the beholder! I love the antiques that belong to my family and have history behind them, but I’m not a seeker of lost treasures from other peoples bins. And I can never understand how the pictures turn up at these sales. We all fight over the pictures and have extra copies made. Part with them? Never. Loved that little pitcher full of plants/flowers 🙂 I am not that creative … but I love that you are! I don’t really collect antiques but there’s one thing I love about Antique stores b/c it reminds me of my Grandmother’s basement. Are you ready? I want to go, too! 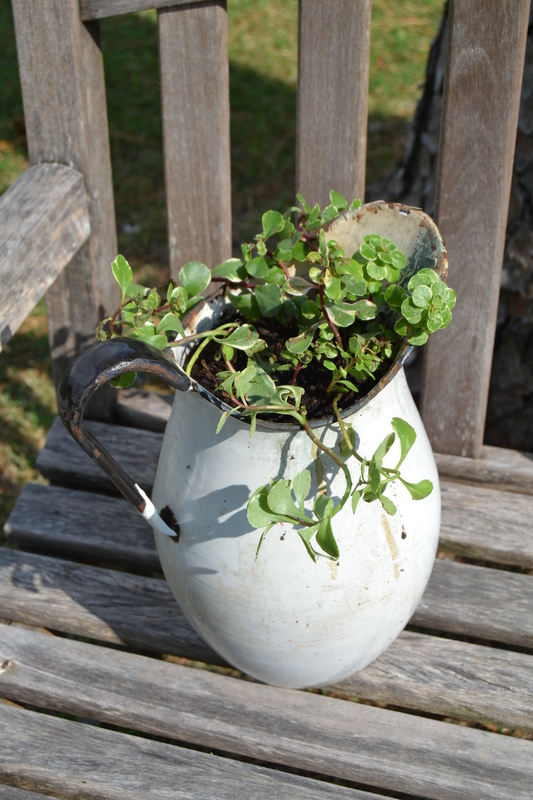 Your enamelware will make perfect potting containers for some things. I like the large coffee pot. The Arithmetic book is quite a find. What wonderful finds! I agree with Marshall that word problems in old math books are a lot of fun to read. It’s absolutely amazing some of the things that were considered appropriate topics for word problems years ago. Oh, what fun! I’m really looking forward to your ‘finds.’ This is a great idea, Dianna! You did torment me but I knew you would love that place the second time as well (really liked that sweet yellow pot with handles too). I think you could add a feature :”Can you identify this?” and I know the perfect one to start with. I have several new places local we are going to visit next time–I think you will enjoy! Great job Dianna.